I posed a question to Quora the other day asking how to ensure that none of my blog posts have been plagiarized. Antone Johnson, former vice president and head of worldwide legal affairs at eHarmony gave me an interesting solution: use Google Alerts. 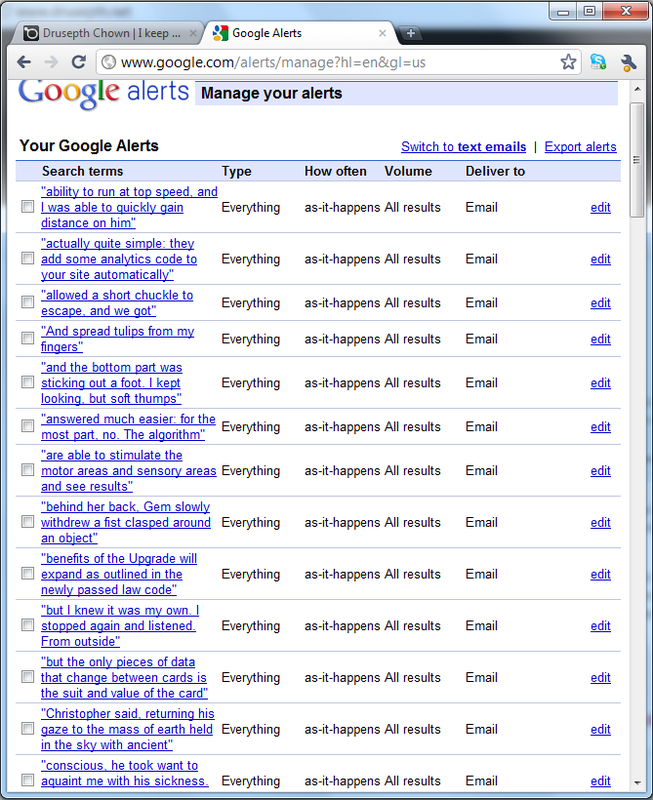 For those of you unfamiliar with Google Alerts, it is a service provided by Google for keeping track of new content on the web. Things like watching a particular news story, keeping current on a company, getting the latest on a celebrity, or keeping tabs on your favorite sports teams can all be easily accomplished by having links to new posts on the Internet emailed directly to you. What Antone suggested, however, is to use the service slightly differently; instead of following a topic, watch for a specific line that appears somewhere in your content. When someone copies your work and it gets indexed by Google (containing that line), you’ll receive an email that consists of the page content and a link to where it can be found. Now, how to handle plagiarism after the fact is another story..